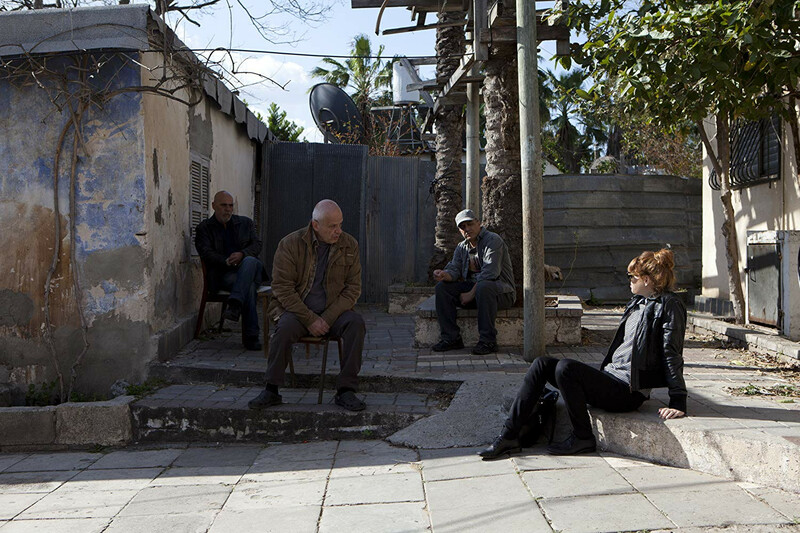 Filmed in one sequence-shot of 85 minutes, Ana Arabia is a moment in the life of a small community of outcasts, Jews and Arabs, who live together in a forgotten enclave at the "border" between Jaffa and Bat Yam, in Israel. One day, Yael, a young journalist, visits them. In these dilapidated shacks, in the orchard filled with lemon trees and surrounded by mass public houses, she discovers a range of characters far removed from the usual clichés offered by the region. Yael has the feeling of having discovered a human goldmine. She no longer thinks of her job. Faces and words of Youssef and Miriam, Sarah and Walid, of their neighbors, their friends tell her about life, its dreams and its hopes, its love affairs, desires and disillusions. Their relation to time is different than that of the city around them. In this tinkered and fragile place, there is a possibility of coexistence. A universal metaphor. Souvenirs d'un (1972, short), Fire Eats Paper, Paper Eats Fire (1973, short), Talking About Ecology (1973, short), Shosh (1973, short), Arlington U.S.A. (1974, short), Images of war 1, 2, 3 (1974, short), Images After War / Après (1974, short), Water (1974, short), Memphis U.S.A. (Faces) (1974, short), Memphis U.S.A. (Suite) (1974, short), Pictures in the Exhibition (1974, short), International Orthodontist Congress (1974, short), Blowing Glass (1974, short), Lucie (1974, short), My Mother at the Sea Shore (1975, short), Charisma (1976, short), Dimitri (1977, short), Border (1977, short), Political Myths (1977, short), Public House (1977, short), Singing in Afula (1977, short), Under the Water (1977, short), Wadi Rushmia (1978, short), Architectura (1978, short), Wadi Salib Riots (1979, doc. ), Cultural Celebrities (1979, short), Carter's Visit to Israel (1979, short), In Search of Identity (1980, doc. ), House (1980, doc. ), Wadi (1981, doc. ), American Mythologies (1981, doc. ), Field Diary (1982, doc. ), Pineapple (1983, doc. ), Reagan: Image for Sale (1984, doc. ), Bangkok-Bahrain/Labour for Sale (1984, doc. ), Esther (1985), Brand New Day (1987, doc. ), Berlin-Jerusalem (1989), Birth of a Golem (1990), Golem, the Spirit of Exile (1991), Wadi, Ten Years After (1991, doc. ), Metamorphosis of a Melody (1992, short), Petrified Garden (1993), War of the Sons of Light Against the Sons of Darkness (1993, short), Queen Mary '87 (1993, doc. ), In the Valley of the Wupper (1993, doc. ), Give Peace a Chance (1994, doc. ), In the Name of the Duce (1994, doc. ), Devarim (1995), Munio Weinraub Gitai Architect (1909-1970) (1996, doc. ), Milim (1996, doc. ), Arena of Murder (1996, doc. ), Kippur, War Memories (1997, doc. ), War and Peace in Vesoul (1997, doc. ), Yom Yom (1998), Zion, Auto-Emancipation (1998, doc. ), A House in Jerusalem (1998, doc. ), Orange (1998, doc. ), Kadosh (1999), September 11-11'09''01 (2002), Eden (2001), Kippur (2000), Wadi Grand Canyon (2001, doc. ), Surgeon General's Warning (2001, short), Kedma (2002), Alila (2003), Promised Land (2004), Free Zone (2005), News from Home/News from House (2005, doc. ), Disengagement (2007), One Day You'll Understand (2008), War of the Sons of Light Against the Sons of Darkness (2009), Carmel (2009), Roses à crédit (2010), Lullaby to My Father (2011), Ana Arabia (2013), Architecture en Israël: conversations avec Amos Gitai (2013, doc. ).